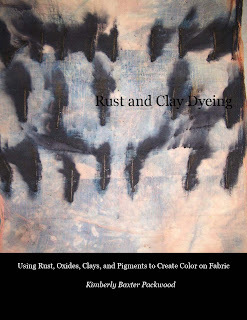 The Rust and Clay Dyeing Book is now available in Print format!!! Anyway... The book is 97 pages and almost every page has color photos on them (I think there may be a dozen pages that don't have an image or color of some sort on it! ), the book is chock of photos. For a limited time the video clip cd will still be available with the book but once they are gone I have plans for a full out DVD, which will be done soon.